Chokers, traditionally defined as being worn high on the neck, measure about 14 inches and are adjustable. The look is romantic from centuries gone-by. Simple design in ornate lasercut steel shapes that are joined across 2-1/4 inches of short necklace front. Patterns under domed clear acrylic, and resin gemstones, are accented by tiny crystals in pacific opal and champagne color. Colors featured include aqua, vanilla, golden brown. Length on stainless chain adjusts 14-18"
Flat collar necklace has warm brown crochet ribbon as its backing, 7/8 inch wide. Onto this 3 distinct rows of beads and stones have been sewn, nearly covering all but the lower edge in the front. One row of beads are glass carnelian and bronze colors At center is channel-set clear crystals. Lower row is salmon-color coral pieces with gold and silver seperators. Toward front are brass charms, faceted clear and aqua color teardrop stones, and a bright turquoise blue glass at center. This has no clasp, it ties closed in feminine fashion, and so you can decide on comfortable length between 16-18 inches. 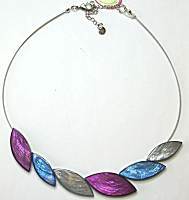 Contemporary and organic, resin elements in a leafy shape, joined in a lovely staggered curve across 6 inches of necklace front. Largest element is 3/4 inch wide, on cable wire that is 17 inches long, lobster clasp, 3 inch extender chain. The resin pieces have metallic within them for a shell effect, shimmering in colors of plum purple, denim blue, silvery gray. 16.5 inches long, a single cord of leather wrapped and stitched, 4mm wide, is joined to a bamboo style magnetic clasp which can be featured at the front of necklace. Clasp is steel, 2-1/2 inches long, it separates between one of the bamboo joints. The steel metal is finished in shiny yellow gold. The leather is dyed light celadon green. 16.5 inches long, a single cord of leather wrapped and stitched, 4mm wide, is joined to a bamboo style magnetic clasp which can be featured at the front of necklace. Clasp is steel, 2-1/2 inches long, it separates between one of the bamboo joints. The steel metal is finished in shiny rose gold. 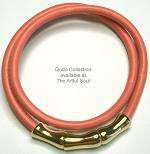 The leather is dyed vibrant coral pink. A 4mm wrapped and sewn nappa leather cord is about 15 inches long, with bamboo shaped steel magnetic clasp at the ends. As shown, wraps 2 times around the wrist. 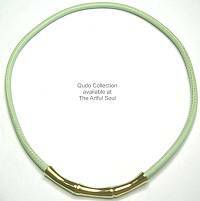 The steel is shiny yellow gold finish, the leather is light celadon green. And, of course, you could wear this as a simple choker instead! A 4mm wrapped and sewn nappa leather cord is about 15 inches long, with bamboo shaped steel magnetic clasp at the ends. As shown, wraps 2 times around the wrist. 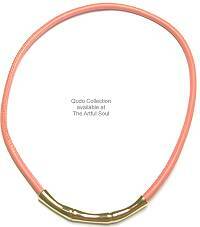 The steel is shiny rose gold finish, the leather is bright coral pink.